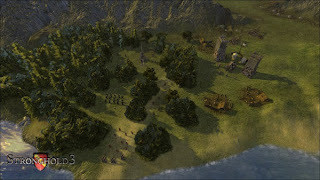 Preview Stronghold 3, promising the best strategy games. 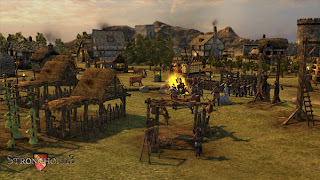 Firefly Studios re-develop a strategy game that is quite popular in 2001 and the second sequel in 2005 with mengandeng new publisher, Southpeak Games. The developer promises new Stronghold game that has reached the 3rd sequel will be coming soon in the game store in a few more months. Wow ... This is a pretty encouraging news. Let's look at the features offered in this 3 Stronghold. The biggest change in this game is the change from two dimensions into a 3D view by relying on the latest game engine named Trinity's Vision Engine and supported by the Havok engine to calculate the physical effects that occur in the real world of this game. As buildings are now destroyed in stages starting from cracks, holes, until then collapsed down. With this new game engine really allows us to be able to see up close the lives of our people during their daily activities, such as livestock, farming, to cut trees and gather wood for processing. Then the ability to see from the eyes of an eagle or zoom out can also cover up to map the entire game. The process of climate change will also be felt by the player throughout the game by changing the color of the blue morning sky became orange while in the afternoon and later into the night that runs in real time. 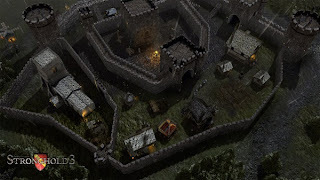 Lighting effects in this game is also getting upgraded and has an important role in the game, like at night that makes us do not know the enemy position which is outside the castle because the visibility is very limited when shrouded in darkness, but we can fire arrows to light the fire angles that we suspect as an enemy position or by sending bersembunyinya soldiers who carry the torch flame to track enemy positions. 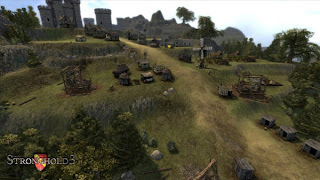 This game also presents a myriad of tricks and traps of war-style medieval times. Like, now we can throw the carcass into the enemy and see the green haze that indicates toxicity or disease to spread and infect enemy soldiers to death. Of course, the tricks and traps in the previous sequel also still presented in this third sequel. Like pouring boiling oil into the hordes of soldiers who tried to break through the castle and then shot arrows into the oil spill fire is to burn all of them or release the logs into the enemy and hit them. Learning from the shortcomings of the previous sequel, the sequel is now three players are given the freedom to design his kingdom without having to be bound by the grid system as in the previous sequel. 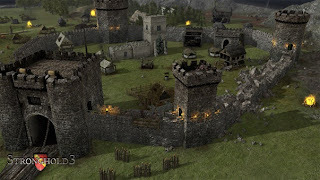 That way, players can create and organize the villagers to build their castle to implement tactics and strategies in the face of waves of enemy attacks. The developer also promised to improve the system of micromanaging in order to become better again. 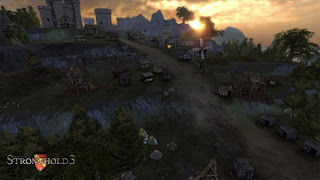 By judging from the media while pictures and video performed by the developer, Stronghold 3 really come up with cool and looks realistic. FireFly Studios seems to have made a massive breakthrough in developing their strategy games by presenting a myriad of new features and graphics that have been adapted to current technological developments.